Vladimir Putin’s power in Russia can often look unassailable. However much Western media might champion potential opponents, the president maintains a tight grip, and it’s easy to see why. Any successor to Putin who was not a puppet would very likely seek to establish their anti-corruption credentials and re-establish Russia’s international credibility by expropriating Putin and others among Russia’s super rich. Several analysts and commentators have suggested that Putin may currently be the world’s richest man. It shouldn’t come as a surprise. The Russian economy essentially operates a kind of tribute system. The rich hold their assets by consent of the state, and in turn ensure that state officials get their share. Putin may sometimes talk about retirement from the stress of his job, but he has also signalled he will run in the next Russian presidential elections, due in March 2018. So could regime change come through democracy? Short answer: unlikely. Discussions about some of the possible challengers, in particular the anti-corruption campaigner Alexei Navalny are interesting, but do not expect any of them to succeed. The Putin regime will control outcomes in this electoral cycle as it has in elections throughout the Putin era. There is simply too much at stake. How does this happen? First, Putin uses absolute control over national television to shamelessly portray himself as the saviour of Russia and source of stability and strength in a hostile world. Regime opponents also find their reputations blackened or, more often, they are ignored and “un-personed”. As a result, for all the Western attention on Navalny, pollsters tell us that just under half of Russians don’t know who he is. By contrast, since the seizure of Crimea in 2014, Putin’s personal approval ratings have remained at around the 80% level. Russian law says anyone convicted of a crime is unable to run for president, although the Russian constitution only excludes those currently behind bars. Navalny has served many short jail terms, and was convicted of fraud and sentenced to five years in 2013, although the sentence was immediately suspended – presumably on Kremlin orders. The state-controlled Central Electoral Commission will decide whether he is allowed to run for office around the new year. Presumably, their decision will be based on whether the Kremlin calculates that it would be better for Putin to be seen to win a genuine contest, or a blatantly fraudulent one. Just getting on the ballot is difficult enough – but in Russian elections it’s not who casts the votes but who counts them that matters. 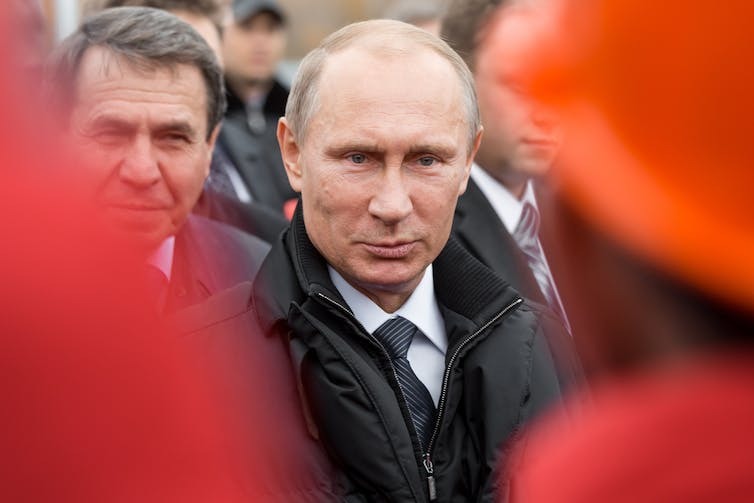 There is much evidence that regional leaders substantially inflate the vote for Putin. As if the electoral obstacles weren’t enough, life in the Russian opposition requires you to accept the risks. Many have spent time in jail. Prominent opposition leaders can also expect consequences for loved ones. In Navalny’s case, his younger brother Oleg was sent down for three years in 2014 on corruption charges which both brothers claimed were politically motivated. Widely circulated stories on social media of how an activist was beaten or unfairly imprisoned can quickly dampen the motivation to challenge the regime. So, if we rule out the ballot box, what are the other possible sources of a change of direction in Russia? We can rule out a palace coup. With the single exception of the Chechen president, Ramzan Kadyrov, there is no political insider in Russia who has a genuinely independent source of power or popularity – this would not be tolerated. In the rules of what Russians call “the system”, offices are in the gift of the president, awarded to trusted friends, and can be easily taken away from independent voices. Putin also plays an elaborate game of divide and rule, ensuring that the powerful ministries – the armed forces, security services and police – are all well-served by the regime but made to compete for resources and bureaucratic turf. Likewise, any oligarch who tried to challenge the Kremlin would quickly find their wealth expropriated, as was the case following Mikhail Khodorkovsky’s criticisms of Kremlin corruption in 2003. To be on the safe side against attempted coups, Putin recently created a new 350,000 strong national guard, under his direct control and led by an ultra Putin loyalist. That leaves us with the possibility of widespread mass protest if change is to take hold. The seeds are there. Living standards have dropped significantly since the 2008 financial crisis sparked a fall in energy prices which has dented Russia’s major source of revenue. Even now that energy prices have begun to rise, recovery is elusive. Navalny is shrewdly exploiting mass anger at official corruption. The video he recently made suggesting that the prime minister, Dmitrii Medvedev, had taken more than US$1 million in bribes has received more than 24m hits at time of writing, although Kremlin spokespeople ignore or dismiss these allegations. There is also increasing evidence of spectacular inequalities and astonishing levels of capital flight, and, unlike in 2012, the anti-corruption protests earlier this year were not just confined to Russia’s biggest cities, Moscow and St Petersburg. They took place in many other places – and it was notable how many young people took to the streets. Russia, however, is not Ukraine. Many of the EuroMaidan protestors who overthrew the spectacularly corrupt regime of Viktor Yanukovich in 2014 were united by an alternative vision of Ukraine as a normal European country in which the authorities are subject to the rule of law. It is wishful thinking to imagine that Russians might unite around such a liberal vision. As we saw during the relatively open 1990s, Russian political society is highly fragmented. Few Russians recognise common interests between their immediate circle. That meant that national political parties did not emerge and politics became highly personalised. This makes the creation of a national opposition movement with common cause very difficult indeed. Dr Matthew Wyman is a Senior Teaching Fellow in Politics at Keele University. His research focuses on contemporary Russian politics. More about Matthews research and teaching can be found here. Next Who should pay for damage associated with climate change – and who should be compensated?